Feeling stressed, anxious, or tired? Like, all the time, no matter how much sleep you get? Does your blood sugar seem out of whack? Maybe the weight is slowly but steadily packing on to your mid-section? Sounds a lot like HPA axis dysfunction (or what we used to call adrenal fatigue). As with the teeth, the thyroid, the gut, and the immune system, what you eat can and does make a difference in the health of your HPA axis. First, what exactly is the HPA axis? And, why is it such a big deal? The hypothalamus, pituitary gland, and adrenal glands make up a complex system called the hypothalamic-pituitary-adrenal loop (a.k.a. HPA axis). The central nervous system and endocrine system connect via this HPA axis, working together to regulate stress response and hormone balance. So, you can imagine how you might feel if the HPA axis wasn't producing or regulating these hormones like it should! When chronic stress occurs in an individual, the HPA axis continues to release hormones on an accelerated basis. But after time, the overproduction of these hormones leaves the glands of the HPA axis desensitized and they stop recognizing signals to stop producing hormones. The negative feedback loop is no longer functioning as it should and HPA axis dysfunction becomes the norm. If you've ever heard of adrenal fatigue, this list may seem familiar. However, the more correct term is HPA axis dysfunction. Read why! 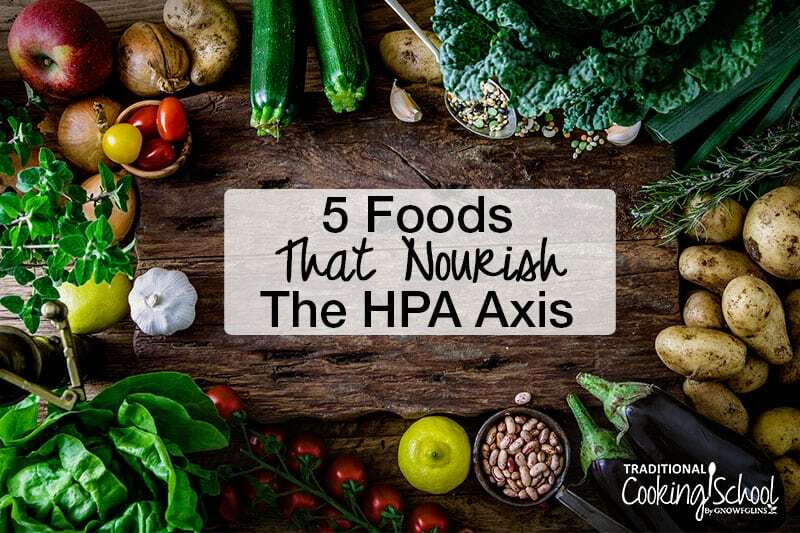 Not surprisingly, the foods that nourish other organs and systems are the same foods that nourish the HPA axis. These foods should be eaten liberally; they should be the main part of your diet anyway — even if you enjoy great health. 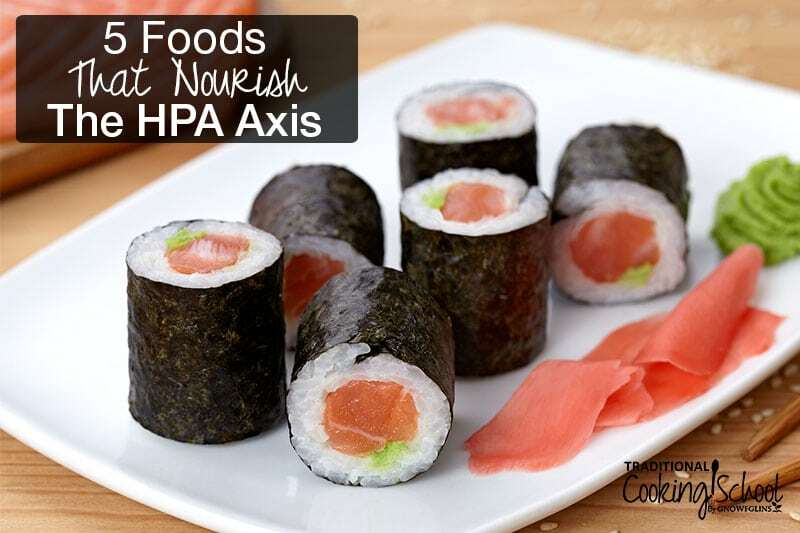 Yet, there are some specific foods that are ideal for the HPA axis. They are both nourishing (to help prevent HPA axis dysfunction) and healing (to be eaten abundantly if and when things go awry). You'll notice that many of these foods (not all) have one important thing in common: minerals! The HPA axis relies heavily on minerals to function properly. Chronic stress, trauma, and food sensitivities rob the body of minerals, resulting in deficiencies that cause health problems. Cravings for salty foods are very common with HPA axis dysfunction. Stress depletes the body of minerals, triggering cravings as the body tries to replenish those mineral stores as quickly as possible. So, you may find a bag of potato chips irresistible or you may find that your food just isn't salty enough. 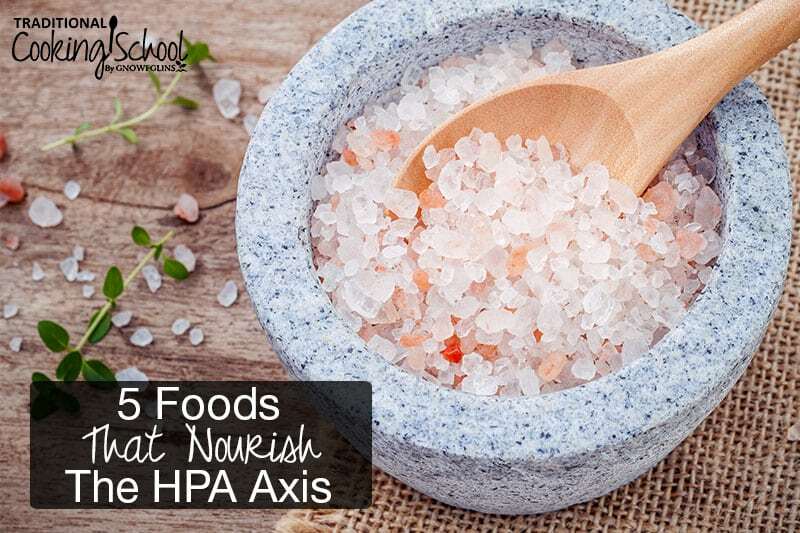 Therefore, REAL salt — full of color and minerals — is essential to the health of your HPA axis and your entire body. Salt is more than sodium chloride. In fact, depending on the type of salt, there are between 60 and 80 different minerals in real salt! These include macro-minerals like magnesium, potassium, and calcium plus trace minerals like strontium, bromine, and vanadium. In contrast, white table salt has just 3 minerals: sodium, chloride, and (added) iodine. Adding a small pinch of quality salt to drinking water is an excellent way to deliver those healing minerals quickly and efficiently. Additionally, don't save the “good” salt for special occasions. Use mineral-rich salt in all of your cooking and fermenting. When you're dealing with HPA axis dysfunction, your energy levels are often very low. Coconut oil is rich in medium-chain triglycerides (MCTs) which are easily digested and quickly utilized by the body for much needed energy. MCTs also improve brain and thyroid function, raise body temperature, and support healthy liver function — all of which are compromised when the HPA axis isn't functioning at optimal levels. Furthermore, MCTs have been shown to assist with weight loss. This is often welcome since HPA axis dysfunction typically causes weight gain around the middle! Add a tablespoon of pure MCT oil to smoothies or hot drinks. 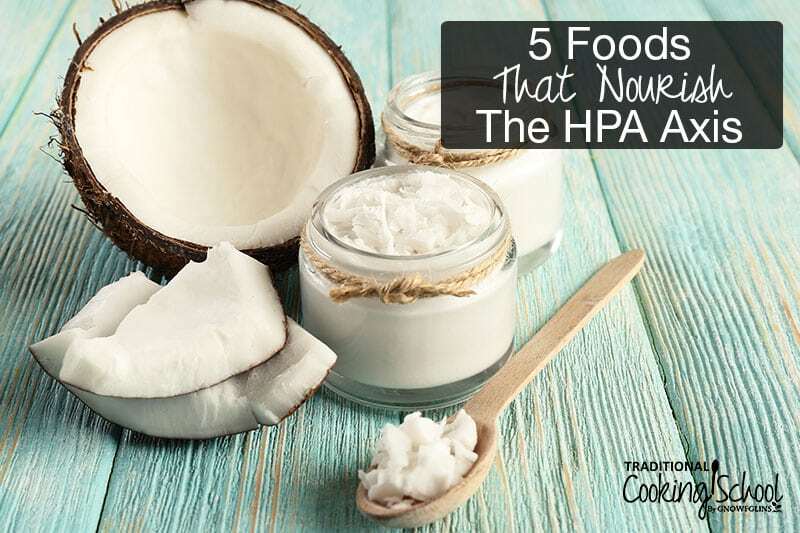 Just be sure to consume coconut oil, too, because coconut oil has other benefits for the HPA axis! It's anti-inflammatory, immune-boosting, anti-bacterial, anti-viral, soothing to the digestive tract, and contains lauric acid which is crucial for brain development and protection against degenerative diseases. Or, just eat it off the spoon! Find out more about buying the best coconut oil and MCT oil. A discussion about minerals isn't complete without mentioning the most mineral-rich food on the planet — seaweed! That's right… Seaweeds (or sea vegetables) offer the broadest range of minerals of any food! Additionally, they are a great source of blood sugar-balancing fiber, protein, and vitamins. Seaweed is one nutrient-dense food! wakame — one of the highest vegetarian sources of Omega 3s, eat it plain or soak it in water to make a wakame salad. kombu — a brown algae, simmer it in broth for 30 minutes to release all its minerals into your broth. dulse — packed with protein and iron, eat it plain as a salty snack! arame — has a mild, sweet flavor and is an excellent choice for beginner seaweed-eaters, soak it first and add to a salad or saute it with onions, carrots, and peppers when making stir-fry. kelp — make your own homemade herb seasoning salt with a secret mineral-rich ingredient: seaweed! There are so many varieties of edible sea vegetables, it's impossible to list them all here. Try incorporating seaweed into your diet a few times per week to reap its benefits and nourish your HPA axis with valuable sea minerals. (Source.) Here's how you can make Real Food Sushi at home! Bonus: seaweed is naturally salty and full of minerals since it grows in mineral-rich saltwater! Soaked or sprouted nuts and seeds are full of enzymes and minerals! Each one is rich in different minerals, too. For instance, Brazil nuts are the richest food source of selenium. Pumpkin seeds are high in zinc, cashews are full of magnesium, and almonds are rich in phosphorus. It's important that nuts and seeds be soaked or sprouted to reduce phytic acid, an anti-nutrient that actually causes mineral depletion. Soaked or sprouted nuts and seeds should also be raw — never heated over 105 degrees — so that all their wonderful antioxidants and enzymes are intact. Here's how to soak and dehydrate nuts and seeds yourself. Or you can buy them pre-soaked and dehydrated to save time! The health benefits of the fiber provided by eating a wide variety of low-sugar fruits and cooked veggies cannot be understated. In fact, I can't think of one health issue that can't be improved simply by eating MORE plant fiber! Fiber helps to stabilize the blood sugar and improves digestive health (source). Constipation is a common symptom of HPA axis dysfunction. So additional fiber is a natural way to remedy this and get your system moving again. 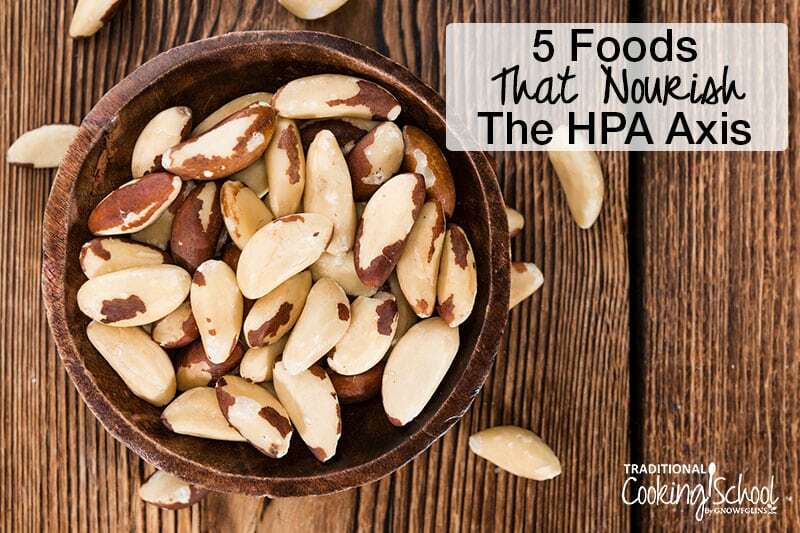 In addition to fiber, vegetables and low-glycemic fruits offer antioxidants, vitamins, and minerals — which are essential for optimum HPA axis function, as you know by now. Low-glycemic fruits are the easiest on your blood sugar. They include strawberries, raspberries, blackberries, green apples, grapefruits, pears, and stone fruits like peaches, cherries, and apricots. Four to five servings per day is a minimum; aiming for seven to nine servings daily is even better! 1 serving = 1/2 cup cooked or 1 cup raw fruits or vegetables. Always aim to eat twice as many servings of vegetables than fruits since too much fruit leads to unstable blood sugar. Cooked vegetables (lightly steamed, sauteed, or pressure cooked) are easier to digest than raw, especially if gut health is compromised. Try to fill half your plate with cooked veggies at every meal. Eat fruits and vegetables with some fat so your body can utilize the fat-soluble vitamins. As you strive to heal your HPA axis dysfunction, remember that diet is only part of the process. Reducing stress, resting more, supplementing, light exercise, using essential oils, and working with a functional medicine practitioner or naturopath are also a big part of the journey to healing. Would you add any foods to this list? Are you trying to heal HPA axis dysfunction right now? I was reading recently about the HPA axis and hot flahses. It says they could be linked. It wasn’t in your list of symptoms here, so I wonder if you agree?! Meanwhile I’ll add these foods, thanks!